Sometimes, in grief, it seems like pixie dust is sprinkling down on me to let me know that Ben is watching over me to give me hope and inspiration for engaging in life. Maybe you don’t believe in that. Let me share an experience I had last night. 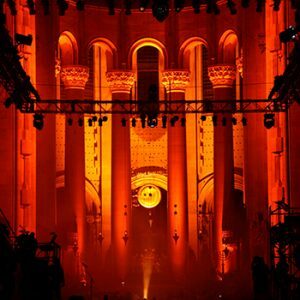 I went to see the Paul Winter Winter Solstice Celebration at the Cathedral of St. John the Divine in Manhattan. It was something I have wanted to do for years. I knew of Paul Winter from many years ago, when my uncle took me to hear a concert. Ben was intrigued, and he liked the Paul Winter CDs I played. 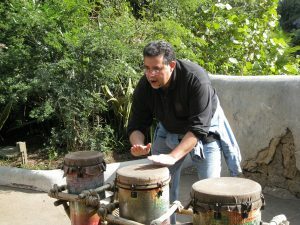 Ben loved music and he was a talented, self-taught musician and music orchestrator. He especially loved playing and listening to the soprano saxophone, which is Paul Winter’s instrument. We just never seemed to make it to a concert. 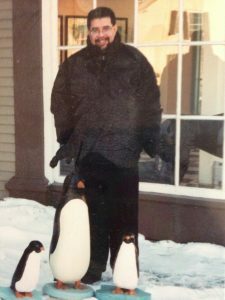 After he was diagnosed with ALS, it was too difficult to get there. I would never have gone without him. I’ve been slowly getting used to doing things that I could not do while Ben was ill. I still experience a feeling of guilt- that Ben is not here to enjoy things, that I should not enjoy life if he cannot- but I am pushing through that to find that balance of continuing to live while I keep him with me in my heart. It’s not easy, and it comes with tears, but I can also say that even six months ago, I would not have been able to do something like go to a concert that Ben would have loved and that I wished we had been able to attend together. The Cathedral of St. John the Divine is a magnificent building, and one of the five largest churches in the world. The acoustics and the magnificence of the building enhance the whole concert experience. I listen to music differently and more intently because of Ben’s love and understanding of it. It’s hard to even describe the concert, other than how incredible it was- it was a winter solstice celebration, with the participation of the Forces of Nature Dance Theater, vocals by Theresa Thomason and, of course, the brilliant consort musicians. The production elements were visually stunning, and we were mesmerized. I did not know that this year, there was a special guest, Gary Brooker, of Procol Harum and “A Whiter Shade of Pale” fame. He also has connections to the Beatles and to Sir George Martin, producer of most of the Beatles’ recordings, as does Paul Winter. Ben was a huge Beatles fan. Gary Brooker talked about when John Lennon was shot, and as a tribute, he sang “In My Life.” This was very emotional for me because it was Ben’s favorite Beatles song, and a song that was even played for him on the day he left this earth. My immediate reaction was that Ben should have been there to hear this and I did shed some tears. However, there was also a deep feeling of comfort, and of the universe at work. It seemed meant to be that after all of the Paul Winter concerts that I missed, that I could finally make it to this particular concert on this particular evening, thinking so much of Ben because of the music, to hear this song and see Gary Brooker, whom Ben would have been so happy to see and hear performing this song with Paul Winter on the soprano sax. Somehow, I just knew that Ben was with me and was part of it. For this first time, this kind experience did not devastate me and overwhelm me with guilt. Instead, it comforted me because it conjured Ben and what he loved. The fact that there was a Beatles connection and Ben’s favorite song was performed was an unexpected but such a special, almost spiritual surprise. 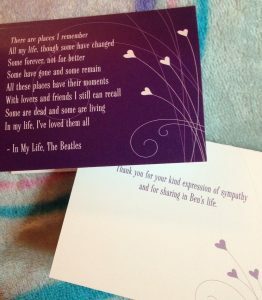 Lyrics of “In My Life” on the card I designed to send to people for their expressions of sympathy. Maybe it was not mystical, but a fortunate, lovely coincidence. Of course, that’s possible. But, my reaction of feeling comfort and even joy indicates a growth in my own spirit, and a shift in my grief. It feels like I have made some progress to believe that I am ready to have this kind of experience and move beyond profound sadness to look for messages of love and hope and connectedness. It has not been a quick and easy process. It is ongoing and unpredictable. 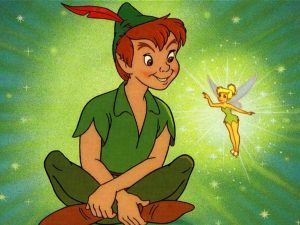 But, moments like last night are positive and empowering, and, also filled with love, and that feels like pixie dust to me. 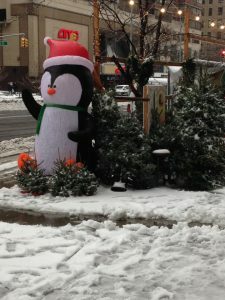 Inflatable penguin at the Christmas tree stand on Broadway in NYC. A Tribute to Walt Disney (12.5.1901-12.15.1966)	In Caregiving and in Grief, I Could Be All Seven Dwarfs, Sometimes in ONE Day!